Rudyard Kipling (1865-1936) was born in Bombay, but educated in England at the United Services College, Westward Ho, Bideford. In 1882 he returned to India, where he worked for Anglo-Indian newspapers. His literary career began with Departmental Ditties (1886), but subsequently he became chiefly known as a writer of short stories. A prolific writer, he achieved fame quickly. Kipling was the poet of the British Empire and its yeoman, the common soldier, whom he glorified in many of his works, in particular Plain Tales from the Hills (1888) and Soldiers Three (1888), collections of short stories with roughly and affectionately drawn soldier portraits. His Barrack Room Ballads (1892) were written for, as much as about, the common soldier. In 1894 appeared his Jungle Book, which became a children's classic all over the world. Kim (1901), the story of Kimball O'Hara and his adventures in the Himalayas, is perhaps his most felicitous work. Other works include The Second Jungle Book (1895), The Seven Seas, Captains Courageous (1897), The Day's Work (1898), Stalky and Co. (1899), Just So Stories (1902), Trafficks and Discoveries (1904), Puck of Pook's Hill (1906), Actions and Reactions (1909), Debits and Credits (1926), Thy Servant a Dog (1930), and Limits and Renewals (1932). During the First World War Kipling wrote some propaganda books. His collected poems appeared in 1933. Note that the Nobel Prize citation did not mention Kipling's "The White Man's Burden" poem, which indicated Kipling's racist and imperialistic beliefs and attitudes. In this poem, Kipling urged the U.S. to take up the “burden” of empire, as had Britain and other European nations. Its publication coincided with the beginning of the Philippine-American War and U.S. Senate ratification of the Treaty of Paris (1898) that placed Puerto Rico, Guam, Cuba, and the Philippines under American control. The racialism notion of the “White Man’s Burden” became a euphemism for imperialism. Folly Bring all your hopes to nought. (1) Cloak, cover. (2) Since the days of Classical Greece, a laurel wreath has been a symbolic victory prize. (2). To write or read a comment, please scroll down to the bottom of this weblog htttp://www.thefilipinomind.blogspot.com/ (the current post or another post you read and may want to respond) and click on "Comments." ANONYMOUS COMMENTS WILL NOT BE POSTED EFFECTIVE 12/07/11. (6) The postings are oftentimes long and a few readers have claimed being "burnt out." My apologies. As the selected topics are not for entertainment but for deep thought and hopefully to rock the boat of complacency..From suggestions by readers, I have therefore added some contemporary music to provide a break. Check out bottom of posting to play Sarah Brightman, Andrea Bocelli, Sting, Chris Botti, Josh Groban, etc. If you've been reading the different Filipino magazines published in California and Las Vegas, magazines such as Asia Journal, Vegas Style, Nevada Examiner, etc. you will surely get sick of what you see and read. so whatever happened during WWII remains to be history only for those who served in the military, still alive and can remember it. And by the way I just came from Manila and you will not like what's happening there, they are now fighting for: who will run for President in 2010 and everything else is being left behind because they are completely focused on should run in both parties. I tell you I can't stand it!!! I came back to Las Vegas one ahead of my original plan. I once heard a wise person tell me that "there is a limit up to when we can blame our parents for our lot in life". I believe that applies not just to our birth parents and to the people who raised us as individuals but also to nations and entities that had an impact on our country during its infancy. If something is inherently wrong with our constitution because of its design decades ago, let's just move on and work to correct it. I honor you for your love and passion towards our beautiful but impaired country. I appreciate and understand what you wrote about and sadly, I tend to agree with you. But I feel encouraged despite all these things since I get visits on my blog; letters and queries from individuals, especially a generation or so younger. I do not see any significant change towards human improvement or realization of the common good in the homeland during my lifetime. However, I still feel hope and want to contribute to it being realized through my own little way such as this blog. I have touched a year or so ago on "the blame game," so you are not the first one to allude to it. Just like in any problem-solving, one has to know the past or circumstances, to discover the cause(s) of the problem(s) and thus be able to identify the options available to solve them. My postings are designed, as indicated in my MISSION statement, to rock the boat. To fight ignorance, apathy/indifference and miseducation. I do not think your wise man is wise or honorable; though such a man/woman may be an effective and efficient survivalist, but to me such is not worthy of respect. Of course, when we die, the world goes on. But when you try to do or fight, in a big or small way, for something uplifting to the humanity of the common tao, one's life was not wasted whether he/she is remembered or not. Unless I am dead wrong and totally misunderstood your comments, let me say this: What the heck are you doing in the USA if you are against US assistance in the two wars that our own Pinoy heroes could not have won on their own? I think you should just go back and start selling pinipig in Quiapo instead since you sound anti-American. First of all, what state do you live at? Are you in Jersey? California? Nevada? Where? Just wondering. No matter what you say, for many decades now, Filipinos are still wanting to better their lives and their family's lives including their lolo's and lola's by relocating and migrating to other countries mostly here if not elsewhere. 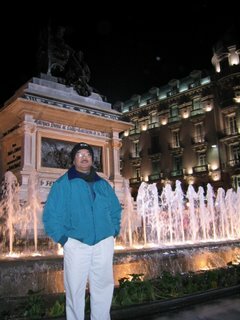 In 2005 I have seen and met hundreds of Filipinos in the Papal City of Rome where they hold their own Filipino Mass on Sundays. I have met several hundreds of domestic helpers and contract workers in the middle east when I was there during Desert Storm/Shield in Kuwait and Saudi and UAE slaving themselves for less than minimum wage income a month. Do you call these people none patriotic? If the Americans did not rescue us when Gen. Douglas McArthur's famous "I shall return" and return he did to the island of Leyte to liberate us from the Japs, where would you and your family be now? Sicty years after the Japs surrendered to McArthur, today our sisters and cousins and relatives and friends are now working their butts off in Japa-yuki? Are they too less patriotic too? Oh no Bert, Because they are only seeking greener pastures to send their paychecks back home in PI. Why do they have to live their beloved native country just to make money? (1) because your own Philippine Pride local born politicians are the most corrupt in the land, (2) because there is no future in that old land we call home. A lot of kababayan who sold their business and homes and went back home to relocate there already came back and had re-established themselves back in the USA. o get your facts straight and think before you spread hatred to America. The Americans came and their own American soldiers died to set us free and protect us from those tyrants. Did they conquer us like those two tyrants did? No, they came to save and rescue us. Go figure. Now the Chinese did not come to colonize us, but for damn sure, they control our country's economy. Multi Billionaires like those who owns them huge shopping malls throughout the country. Lately again an influx of Japs buying the properties by the water and converting them to 5 star resorts. They got the monies to invest, we don't on our own. They may have lost the war but are winning the economic battle nowadays. How many Chinese born in China that can't speak straight Tagalog do you know in PI? They are not born in PI but paid large sums to become citizens in PI? Now, they are super rich, they are politicians whom Pinoys work for? You need to look into that too and stop staring at them Yankees. Now, the camel jockeys are also investing in PI. They did not come to conquer, but are spreading Islam through that region and will kill Christians when the time comes. Who will rescue you then? The Brits? The Canadians? Oh no, Americans will- although GMA pulled her troops from the War on Terrorism because she got scared and broke down and now is an ally of the powerful Sheiks with a lot of Portions straight to her bank accounts too. * "you don't trample God's laws and expect no consequence...."
Not to be rude by interjecting myself in your discussion I thought I'd jump in because I think you're being unfair to Bert and his point of view. Nothing that Bert said about US imperialism and Rudyard Kipling was incorrect, inaccurate or wrong. He's just citing historical facts in US colonization of the Philippines and Rudyard Kipling's moral character as a racist. You seem to question Bert's credibility and imply hypocrisy on Bert's part for remaining in the US instead of "selling pinipig in Quiapo." Isn't Bert entitled to speak the truth? I could care less if the truth makes Bert sound anti-American -- he's simply citing historical fact. If historical facts say the US did some pretty nasty things in the past and followed some pretty messed up policies in its history in relation to other countries, Bert isn't being anti-American at all -- that is, if being pro-American means covering your eyes in willful ignorance of history and attacking the credibility of the speaker instead of listening and acknowledging the truth in what he says. You make some good points when you cite that it's not only the US that is guilty of exploiting the Filipino. You cite the Chinese, the Arabs, the Japanese as being guilty as charged in these cases. In that case, why do you reserve your ire for Bert whose only offense it seems is saying some uncomfortable historical facts? Instead of making sharp, contemptous observations about those who have exploited and currently exploit Filipinos you reserve your contempt for Bert. I don't understand that at all. You said that young Filipinos don't care about history in response to Bert's post about US imperialism and colonialism. You seem to say it to discourage Bert from posting items in his blog about the messy history between the US and the Philippines. It is as if you are saying to Bert and to those who care about the issues this history raises that they are wasting their time. I would have to disagree with you. 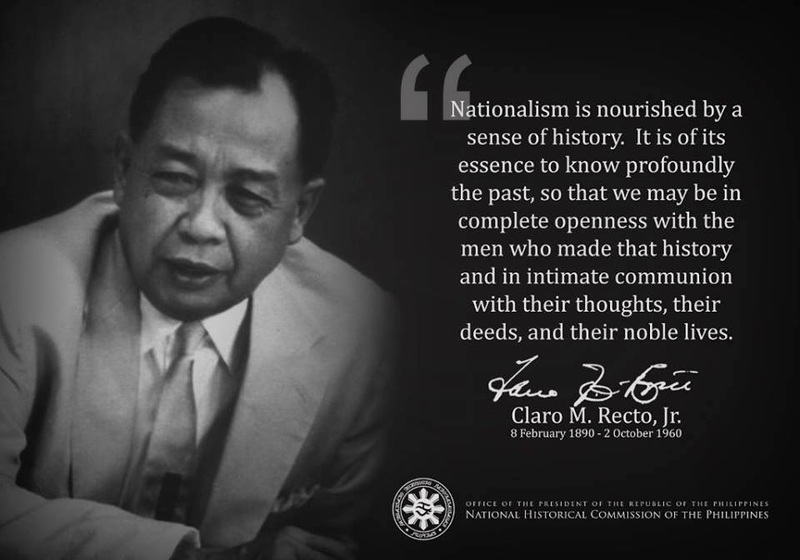 There are Fil-Ams out there that care about history. A lot more than you think. Here's some examples of Fil-Am bloggers who are well-acquainted with history and who blog with a political and social conscience: here, and here. I am also a Fil-Am blogger who writes about Fil-Am issues. And to Anonymous #2: I don't think Bert is involved in playing the tired "blame game." He is merely citing historical fact, no matter how uncomfortable it might make some people. Nothing that Bert said in his post is inaccurate or untrue. He's just telling the truth. Having said the truth -- what then? I think this is a fair question to pose to Bert at this point. Hello Bert, Unless I am dead wrong and totally misunderstood your comments, let me say this: What the heck are you doing in the USA if you are against US assistance in the two wars that our own Pinoy heroes could not have won on their own? I think you should just go back and start selling pinipig in Quiapo instead since you sound anti-American. First of all, what state do you live at? Are you in Jersey? California? Nevada? Where? Just wondering. No matter what you say, for many decades now, Filipinos are still wanting to better their lives and their family's lives including their lolo's and lola's by relocating and migrating to other countries mostly here if not elsewhere. Why? there is no real future there unless you are super rich. Most people are corrupt and you know it. From Barangay captains to the highest office in Congress lots have been bought for a price. So when the Yankees came to set us free two times historically, first from the Spaniards and second from the Japs, does that make them the bad guys? They do deserve to invest the way they did to help the economy grow....who else would invest in a country that just got all torn up due to the war? Today, would you invest in Iraq? I did not think so. So get your facts straight and think before you spread hatred to America. The Americans came and their own American soldiers died to set us free and protect us from those tyrants. Did they conquer us like those two tyrants did? No, they came to save and rescue us. Go figure. Now the Chinese did not come to colonize us, but for damn sure, they control our country's economy. Multi Billionaires like those who owns them huge shopping malls throughout the country. Lately again an influx of Japs buying the properties by the water and converting them to 5 star resorts. They got the monies to invest, we don't on our own. They may have lost the war but are winning the economic battle nowadays. How many Chinese born in China that can't speak straight Tagalog do you know in PI? They are not born in PI but paid large sums to become citizens in PI? Now, they are super rich, they are politicians whom Pinoys work for? You need to look into that too and stop staring at them Yankees. Now, the camel jockeys are also investing in PI. They did not come to conquer, but are spreading Islam through that region and will kill Christians when the time comes. Who will rescue you then? The Brits? The Canadians? Oh no, Americans will- although GMA pulled her troops from the War on Terrorism because she got scared and broke down and now is an ally of the powerful Sheiks with a lot of Portions straight to her bank accounts too. Now tell me if the Americans are the bad guys. "you don't trample God's laws and expect no consequence...."
Thank you for your interesting response. But allow me to disagree. Firstly, I do not remember that I alluded to anyone leaving my homeland, my birth country (Philippines) as unpatriotic especially with reference to the 8-9 million or so who either permanently or temporarily emigrated as guest workers in various countries, under varying conditions of employment. Secondly, I agree with you here. The Filipino diaspora is essentially due to economic hardship. I still call that old land my homeland. Fourthly, I note you had military service; thus I am not really surprised with your points of view. I actually tend to expect that given where you were trained, worked and apparently to retirement. I have read similar letters sent me from American navy veterans who had chosen to retire in the homeland. Lastly, to be a patriot in a true democracy is not to have an attitude of "my country wrong or right". Patriotism in a true democracy is also exhibited in the questioning of his country's actions when one thinks that his nation is wrong, i.e. morally in terms of human progress, on'es country's self-proclaimed "civilized people" and/or in the eyes of the world of sovereign nations. If you understand and agree with the US Constitution, the pronouncements of so-called Founding Fathers and the UN then you know what I am talking about. How dissent is seen or treated is a measure of how truly democratic a country is (when it proclaims itself to be one). Anyway, I frankly do not write and/or post in my blog to debate, which I consider at this point in my life as puerile and a waste of time. I blog to "rock the boat," to make the reader think critically, as expressed in my blog's Mission Statement. Also I have addressed the allegations of the "blame game" two years or so ago. It is posted in my blog. Thanks for your quick reply. Don't hold it against me if I retired in the US Armed Forces here. I considered that a true priviledge instead cause not everyone could nor have retired with 28 years of service. But I do agree that it is futile to argue especially if the subject is history. It's all done and over with that is why its all "his-story." First of all, no one wins an argument. Secondly, the Americans had the money to invest. The way you and others view these things seem to not matter even if the Russians came and spent their tax money and soldiers lives to help us out from under the Japs invasion in WWII? You'd still accuse them of the same crime of passion? You'd still call them imperialism although they are communist.... Well, they just happened to be Americans instead and freedom is what Filipinos enjoy now since. Be thankful for that. I have no time to read all you've written in your blog nor am I truly interested. But with a one track mind, and most Filipinos do, it will not get you or them any further than where you are all right this moment. Corruption is all over the country and there is no cure for that. It's a cancer and a way of life in PI. No hope for a better government there. How do you clean up the government? You get rid and kill all people presently in power and start fresh? That will make you like Fidel Castro or Mussolini. That is absurd. If you think you can, let's see how far you can go brother. But mere writing in your blog online is not going to cut it. Obviously you were not in favor of the Statehood for the Philippines in the early 70's either. You also evaded my question as to what state you reside at. Your gmail email is stateside, so you should really go home and work it out there and maybe, just maybe you will have some impact on what you are trying to accomplish. You could be the next Ninoy Aquino if given the chance, but you have to go home to become a hero. Are you on exile here? Or here because of the good amenities and good life that the Philippines do not afford unless you are the Chinese family Sy who owns Shoemart and the Zobel's who owns 1/3 of the land in Manila, etc. Was it Imelda or Cory Aquino who has brother-in-laws last name was "Co"juang"Co?" That is really a chinese last name. That's not Santos, or Mamaril, or some real true pinoy last name. Why don't you write some things about them? just to be fair. I know you too knows of many filipinos who sold their souls and married other dark-dark skin americans just to live in the states. Are they unpatriotic? I had a former co-worker in the post office in SF who promotes Chinese Communism although he is ABC American Born Chinese. I told him to go to China and live there so he will see and feel first hand what its really like to live under the communist government. He refused to relocate. I'd say the same to you. If you will continue to promote your "patriotic idealism" and continue to be unworthy of living in America, you really should go home and start your campaign there, not here where you benefit from the American form of government and free society and easy living. It could have been the Spaniards that stayed there for 333 years, but no mention of that here. It's just the Americans that you hate... Where were you in 1991 when erap begun his unpatriotic stance to remove the US bases in PI? I supposed you voted for the US bases to leave? But the Lord had much better plans. HE allowed for Mt. Pinatubo to blow up before the documents that were rigged and over priced rantal agreement got signed - so the US saved a heck-of-a-lot of money when the ashes fell all over the bases in Pampanga. That was a classic "Act-of-God." Thank you Lord. Oh yeah, you did not say anything about the Chinese controlling the Philippine economy now, and the Japanese owning the 5-star beach resorts and buying "good time" flying to PI on the weekends to buy pinays 18 years old and under and spending their monies and promote prostitution in the land. No mention of the Arabs spreading Islam all over the country and buying lands to get richer and overthrow the democratic form of government because they were refused to give up Mindanao as an independent state away from the PI government rule? Is that alright with you Bert? When the Japs come to PI to have "good time" and some Japs do actually fly there just for a weekend of fun with our kababayan pinoy ladies, is that an acceptable practice to you my friend? Pls reply. But mind you, those are not Americans. That's the best part. So in other words, you will condone and it's quite alright for the other foreigners to ransack our "natural beauties?" but it's off limits to Americans. Is that a good statement to say? I do not hold anything against you; I do not even know you. We are in a supposedly free country. So live and let live. As long as you allow others to do the same. Anyway, I have read your his-tory and there's really nothing new. Sad to know you do not have the time and interest to check out my blog addressing your issues (you are not the first one to raise such). Given that, I am sorry to say that I similarly do not have time to re-state them just for you. Enjoy your retirement. Cheers and thank you for taking a bit of your precious time to write. PS. Jim was responding to my emailed book "American Doublecross of the Philippines - by Dr. Salvador Araneta." I do not know how Jim got hold of it; apparently from someone in my mailing list; but I doubt if ever he read it. Anyone interested with the book can email me from a free copy. marahil noong panahon ng mga Griyego ay itinuturing lamang. ...U.S.A. malapit na nga kaya ang 'expiration nito?